A career in veterinary pharmaceutical sales is an excellent option for those with strong communication and sales skills. 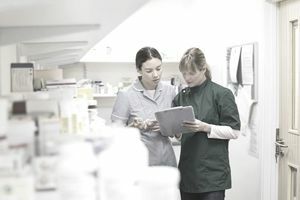 Veterinary pharmaceutical sales representatives are responsible for marketing animal health products directly to veterinarians, animal hospitals, and other businesses working in the field of animal health. Sales representatives must constantly educate themselves about the market and their product, staying on the cutting edge of industry trends and new advances in the animal health field. The two types of veterinary pharmaceutical sales representatives are inside sales representatives and field sales representatives. Inside sales positions do little, if any, traveling. These representatives conduct all of their business either on the telephone and through online order processing. Field sales positions, on the other hand, require frequent travel throughout a designated territory, which could be a city, state, or larger regional area. These representatives call on veterinarians in person at their place of business in order to sell products or provide training related to such products. All sales representatives work under the supervision of a sales manager who ensures that representatives meet their assigned quotas for each month. Veterinary pharmaceutical sales representatives can move up the ladder to become sales managers or sales directors. They can also transfer their skill set to other sales careers including those within the animal health industry, such as veterinary device sales rep, as well as positions outside of the animal health industry. Pharmaceutical sales representatives hail from a wide variety of educational backgrounds. A bachelor's degree in an area such as marketing, business, animal science, chemistry, or biology is considered extremely desirable for candidates pursuing entry-level positions. A master's degree will make you even more marketable and will greatly improve your chances of advancing up the ladder to a managerial position. Working knowledge of sales, marketing, anatomy, physiology, biology, pharmacology, chemistry, and public speaking is beneficial for candidates seeking a position in the field of veterinary pharmaceutical sales. Veterinary office experience is also a big plus that can carry a lot of weight with hiring managers because of the hands-on exposure to a certified veterinarian and the direct handling of different kinds of animals. Computer skills are also key because a great deal of the recordkeeping and order tracking is done through web-based database systems. Once hired, most new recruits go through a company-sponsored training program and are partnered with an experienced sales rep for a period of time before going out on their own. In addition to the basic requirements and your love of animals, you'll need to develop your organizational skills so that any question you are asked when you are in the field can be answered without having to reply to a request, "Let me make a call and get back to you on that." You need to be up to speed on how the veterinary pharmaceutical industry works, who the major players are, and possess an understanding of the relationship between drugs and common diseases. Before you begin your job search you need to freshen your resume. Even if you have never had a job in the pharmaceutical industry, you can still sell yourself on your resume. People skills, sales skills, and any work with animals and animal organizations are all factors pharmaceutical companies are looking for. You should also attend seminars, meetings, and conferences that relate to the animal pharmaceutical field and list all of these on your resume. Networking is also key. Many times people attending industry events are going to know about openings in the field long before the jobs are advertised online at big job boards like Indeed.com or SimplyHired.com. It's also advisable to search the web and join all relevant online social groups related to veterinary pharmaceutical sales. The more avenues you explore, the better your chances of landing a job. The National Association of Pharmaceutical Sales Representatives (NAPSR) has a website and offers training programs to help entry-level pharmaceutical sales reps advance in their careers. The association is widely known for its Pharmaceutical Sales Training Program (CNPR) available to candidates who want to enter a pharmaceutical sales career. The NAPSR website lists all the colleges and universities nationwide where you can enroll in a training program. The salary for sales representatives may include a combination of incentives including the standard base salary, commission on sales revenues, use of a company car, performance-based bonus pay, and a benefits package that often includes health insurance and vacation time. Total compensation varies widely based on sales volume, years of experience, and your assigned territory. Logically, big cities like New York, Chicago, and Los Angeles will pay more because of the high cost of living. That said, according to sites like Payscale.com, pharmaceutical sales representatives can expect to earn a salary ranging from $59,122 to $119,826 a year. New sales reps tend to earn salaries in the $30,000 to $40,000 range. According to a 2017–2018 National Pet Owners Survey conducted by the North American Pet Health Insurance Association, 68 percent of U.S. households, or about 85 million families, own a pet. This represents a 17.2 percent increase between 2014 and 2015 (the most recently available statistics). Given the increase and sheer volume of pet ownership, the job outlook for veterinary sales reps is bright.